Robot Cache has opened early-access sign-ups for gamers interested in joining the new digital distribution platform founded by Brian Fargo. 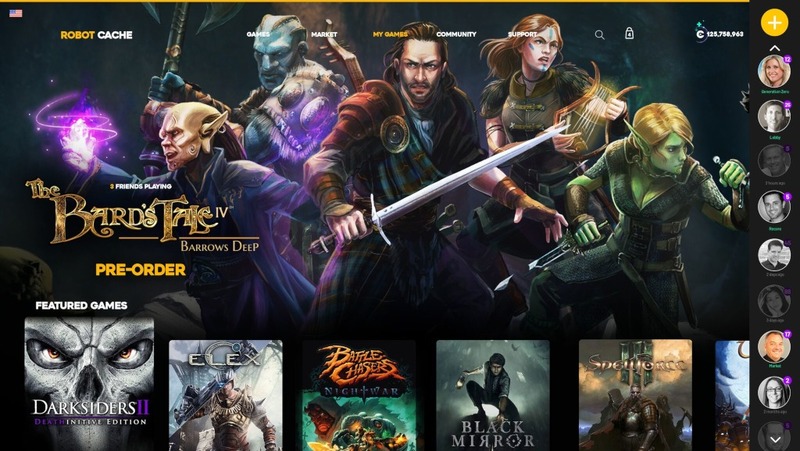 It aims to be the world’s first decentralized PC video game distribution platform, allowing players to resell digital copies of games they no longer play. The early access period begins in October 2018, but those interested can sign-up now at https://www.robotcache.com/. Those who join now will become life-time members inducted into the Robot Cache Founders’ Club. They will get rewards and special offers from Robot Cache, as well as from developers and publishers. This includes a Founder badge to display on your profile. These perks will only be available for those that sign up between now and the end of the Early Access period, which ends when the platform officially launches. The new digital video game distribution platform also has its own cryptocurrency called IRON, which you can mine and use to purchase games on Robot Cache. One IRON token is roughly equal to one Euro, according to the press release. Robot Cache also gives game developers and publishers a bigger cut of the pie, with 95% going to the developers and publishers behind the games. That’s about 25% higher than the current industry standard. For those attending Gamescom 2018, you will have the opportunity to collect rare Robot Cache Founders’ Club pins at the RocketBeans merchandise booth (at Hall 05.2 | Stand A015). These pins come in two limited edition colors and include codes for IRON tokens. The IRON cryptocurrency tokens can be redeemed on the Robot Cache platform and used toward game purchases once the platform has launched.